Sitting alongside a number of European and American personalities, whose countries allegedly bear the flag of a global war against terrorism, you can see the leader of a designated terrorist group in a conference held in the European Parliament in Brussels on February 7. Of course, all personalities present in the conference, either those occupying an official post or formers, knew well whom they were in her presence, Maryam Rajavi – the Paris based leader of a terrorist cult in the absence of her husband, Massoud Rajavi. Among them you could see Jim Higgins, member of the European Parliament presided over the meeting, Alejo Vidal-Quadras, Vice President of the European parliament; Struan Stevenson, President of Delegation for Relations with Iraq of the European Parliament; Howard Dean, former Chairman of the U.S. Democratic Party; John Bruton, former Prime Minister of Ireland and former EU Ambassador to U.S.; Patrick Kennedy, U.S. Congressman (1995-2011); and Senator Robert Torricelli (1997-2003. The question raised in my mind is, what kind of relation could these people have with the representative of a terrorist cult still on the State Department’s terrorist list? I recall a time when Mojahedin, in the early days of Iranian Islamic revolution, reiterate their antagonism with the American imperialism in many published statements and articles in their own publications after the Islamic revolution. In the first two years of the post-revolution, Mojahedin showed no open antagonism against the regime and tried to highlight a coalition with it to inoculate an extreme anti- imperialism and anti-American vision in the Islamic state and among the public. As part of their revolutionary slogans, they called for the establishment of a nationalist, democratic government that they hardly believed in as they consented to no system exclusive of socialism. During the 9 month post-revolutionary period, from the victory of Iranian revolution in February to the takeover of the American Embassy in November 1979, Mojahedin frequently accused all religious leaders, except Ayatollah Khomeini and mostly for political considerations, and ranking authorities of negotiating and compromising with American imperialism especially after Brzezinski-Bazargan fortuitous, brief meeting in Algiers on 1 November 1979. The importance of the embassy takeover lies in the fact that the incident turned into a golden opportunity for Mojahedin Khalq to start an extensive political-ideological propaganda. It might be true to say Mojahedin hardly played any role in the occupation of the embassy, but their role to aggravate the situation to turn it into a crisis lasting for 444 days is an undeniable truth. Concerning this fact as a part of the group’s anti-imperialist struggle, in the US State Department’s report of 1994 we read; “As part of that struggle, they assassinated at least six American citizens, supported the takeover of the U.S. embassy, and opposed the release of American hostages”. 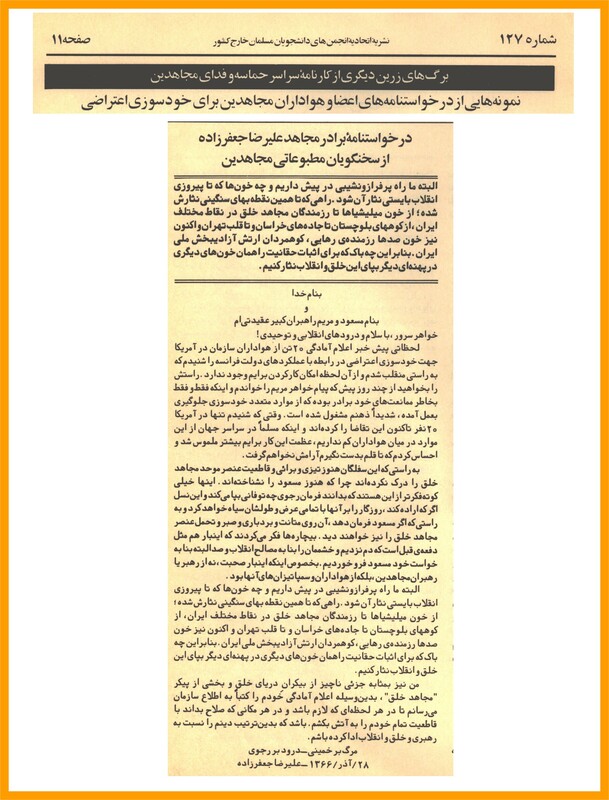 But Mojahedin fail to recall that while Iranian authorities tried to achieve a solution to end the crisis, it was Mojahedin who through numerous announcements and messages draw sketches for total annihilation of imperialism, warned against possibly made concession vis-à-vis America’s threats and announced their readiness for nay military confrontation with it. 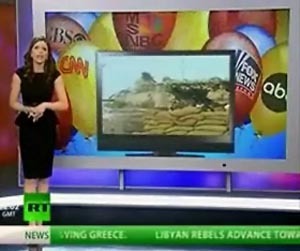 They repeatedly proposed their own logical anti-imperialist suggestions to regime’s authorities to confront America, including seizure and confiscation of American assets in Iran and annulment of all signed contracts and drawing a sketch for total annihilation of imperialism. Evidences never fail to reveal the truth. 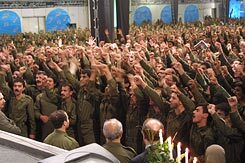 There are numerous facts published in Mojahedin’s publications that prove the critical role of the organization in intensifying the created tension and crisis to advance their so called anti-imperialism objectives and to win a public support to initiate an aggressive campaign against the main Capitalist camp, namely America. Maybe Mojahedin never anticipated that in less than two decades they would have to make desperate attempts to acquit themselves of what they refer to as the accusations and its leaders would sit alongside some retired imperialist fed officials urging them to support the group out of some crises. For sure Mojahedin are the same leopards that have never changed their spots and the American sides are well aware whom they have leashed. But to sit with them at the same table, even if for political interests and causes, seems to be as illogical as unleashing beasts that could well terrorize the world for a mere achievement of trumpeted democracy the group itself has the least faith in. and I hear many people asking: If Mojahedin Khalq is a terrorist group, why are its supporters allowed to serve in Congress? According to Evining Standard, some British parliamentarians are angry at Theresa May, the Home Secretary, after she barred Maryam Rajavi from coming to Britain. The ban was imposed on Maryam Rajavi after the Home Secretary claimed that her presence on the country’s soil might damage efforts to stop Iran obtaining nuclear weapons and put Britons in the country at risk. Baroness Boothroyd, the former Commons Speaker, and Lord Waddington, a former Conservative home secretary, have denounced the ban as “intolerable” and are bringing a judicial review in an attempt to overturn it. After her presence in the European Parliament, Rajavi was invited by the British peers and MPs to speak in Parliament but was refused permission to visit Britain after the Home Office ruled that it would have a “significant damaging impact on relations between the UK and Iran”. 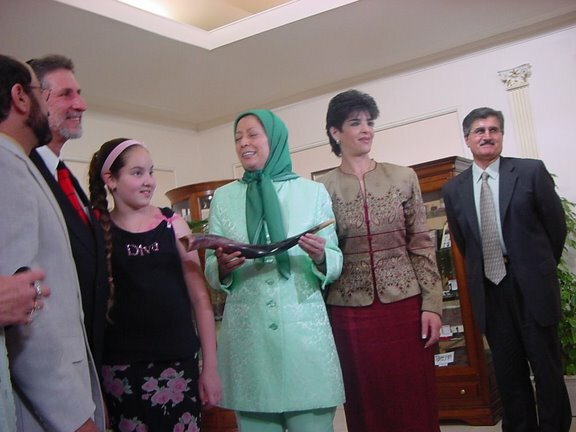 Maryam Rajavi was originally excluded from Britain in 1997 because of her leadership role in the terrorist MKO, a group proscribed as a terrorist organization before the ban was lifted by the Britain’s Court of Appeal in 2008. Mrs May renewed the ban in October last year and again last month. A strong napalm bomb blasted at 3 o’clock on the Sunday’s afternoon 8 Shahrivar, and martyred president Mohammad Ali Rajaii and the prime minister Hoj. Dr. Bahonar and some others were left injured. This explosion occurred while the National Security Council’s meeting was being held in the presence of the president, the Prime Minister, and the military authorities. Besides these faithful friends of Imam, Mr. Daftarian, the prime ministry’s authority, was also martyred. Forthwith after the explosion, the guards, fire brigade, the police and emergency services arrived and began the rescue operation. Fire was blazing and the conference room was filled with smoke and soot. The people in other floors were evacuated immediately and the relief teams’ helicopter strove to extinguish the flames of fire. Meanwhile, having heard the sound of explosion, people gathered outside the building to help the relief teams but the president and the prime minister were not among the injured. Recognition of the burnt dead bodies was also impossible. Some of the injured were given immediate treatment and some others were rushed to hospital. At last, at midnight it was to be known, that unfortunately, both the president and the prime minister had surrendered their souls to God. The assassin was identified as Massoud Kashmiri, an operative of the Monafeghin terrorist grouplet (dubbing themselves as the MKO), who had infiltrated the Prime Minister's office. Mohammad Ali Rajaee was born in the city of Qazvin in 1933. He lost his father at the age of four but could manage to complete his studies at the elementary school under the supervision of his mother and elder brother. At the age of 14, he left Qazvin for Tehran to work in Tehran bazaar. Later he took part in the Air Force Entrance Examination at 17. 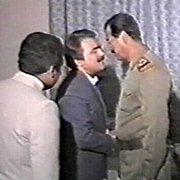 In there, he cooperated with Fadaeeyan Eslam', which carried out activities against Pahlavi regime and benefited from the late Ayatollah Taleqani's classes. In 1953, for his political activities against Palavi’s regime, he had to resign from the Air Force. Therefore he began his new career in Education Ministry as a mathematics teacher. In 1970, he left Tehran for the city of Khansar and later returned to Tehran to continue his studies in the field of statistics. Although he continued his political activities and cooperated with Students’ Islamic Association. He was arrested in 1973 and got imprisoned but was released in 1978. He endured harsh tortures in Savak jail, but he didn’t abandoned his revolutionary aspirations. After the Islamic Revolution, Rajaee was appointed Minister of Education. In 1980, for his conspicuous activities in order to help the Islamic government, he was appointed prime minister of the Islamic Republic of Iran and was later elected as president. In his presidency period, he appointed Shahid Bahonar as his prime minister. His presidency period was along with the beginning of Imposed war and for this reason he faced many difficulties made by internal and external enemies. But he was not dissapointed. During his life he was so humble and respectful. Although in the last years of his life, he had high ranking positions but he always preferred to introduce himself as a teacher, not as a minister or president. He considered these positions as God’s examination and always advised his friends be careful about his behaviors and attributes in order to control his sensual desires. People were always surprised by seeing his simple life as a president. Martyr Mohammad Javad Bahonar was born in 1312 (1933) in "Mahalleh Shar" of Kerman. At the age of 5, he entered the tradition school of maktab to learn Quarn and when he was 11, he entered "Masoomiyeh" school of Kerman where he started the theological education. Along with this, Bahonar also under took the normal high school education. In 1332 (1953) when he was 20 years old, he left for the Holy city of Qom in order to complete his theological education. In Seminary, he enjoyed the guidance of the outstanding figures such as Ayatollah Soltani, Mojahedi and Sheikh Mohammad Javad Esfahani. Among his other professors one could refer to Ayatollah Borujerdi (the professor of urisprudence (Fiqh), late Imam Khomeini (Rh) the Great founder of the Islamic Republic of Iran (the professor of theological principles (Usul) and Late Alameh Tabatabaee (Rh) (the professor of Quranic Commentary (Tafsir) as well. He was also successful in his Academic studies for, he completed his studies to the extent that he received his B.A of Theology and later, M.A of pedagogical sciences and finally PhD of theology at Tehran University. Martyr Dr Mohammad Javad Bahonar in spite of the objections of Savak (then security and intelligent service) was employed in the Ministry of Education. He was not only involved with teaching, but also was cooperating so closely with the office of propaganda and planning of the education ministry to the extent that the syllabus of religious classes of the different levels was prepared and managed under him. Along with fore- mentioned activities, he began to write the religious text books for different levels of education which resulted in 40 books and pamphlets. Nothing could make him give up his aims for; even when he was forbidden to give lectures and doing some modifications on the text books. Thanks to God's blessings and efforts of some of his colleagues, he was dealing with install and run of the office of the spreading the Islamic culture, schools of "Refah" and "Mofid" and the like. He had been arrested for several times by Shah's regime, due to his politico- religious activities, but he kept right on adhering to his ideas. After he was freed in 1357 (1977), he officially started his activities through formation of the Islamic Republic party among his colleagues at this time one could refer to Martyr Beheshti who is famous enough in the history of Islamic Revolution. Bahonar after martyrdom of Dr Beheshti was appointed Secretary General of the party and until the time of his premisrship he held the position.